RoundTable Studio is a leading provider of translation and localisation services for the Spanish and Brazilian Portuguese language markets. With production centres in Brazil and Argentina, and a small business and project management unit in Spain, RTS and its team of more than 50 linguists, project managers and technical experts serve a worldwide client base across many vertical markets including IT, business & finance, and manufacturing. The company’s quality ethos and high level of customer service are significant factors in their success and reputation within the industry, and their openness to new technology is proving to be an important factor in their increased competiveness and company growth. Global collaboration and increased competition are formidable factors which are affecting both the translation industry and the industries it serves. Consequently, LSP’s like RTS are beginning to search for scalable, cost effective solutions which will help them bridge the gap between meeting expectations of ever faster turnaround times and maintaining high quality standards at affordable rates. Laura Grossi, Localisation Engineer at RTS confesses that “sometimes there are just not enough linguists to carry out jobs” – this is a feeling that many LSPs in search for a capacity solution are echoing. RTS has been active in Machine Translation since 2005 when the company started working with one of its key clients on a focused Machine Translation initiative. This relatively early exposure led to the company building substantial technical and practical expertise, as well as a firm belief that Machine Translation has an important role to play in the future of the industry. In addition to collaborating with client specific Machine Translation programs, RTS also realized the need to find a solution to help integrate Machine Translation selectively into its tools portfolio. However, finding an Machine Translation provider which would give them the freedom to manage and control their Machine Translation activity in a strategic manner proved to be a difficult task. RTS assessed and tested a number of Machine Translation solutions before being introduced to KantanMT in October 2012. The company was immediately impressed by the simplicity, flexibility, control and evaluation metrics that the KantanMT platform provided. 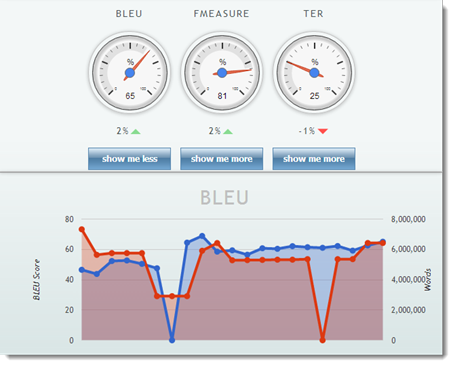 Using KantanMT quality evaluation metrics, including BLEU, TER and F-Measure, RTS was able to expand its knowledge and improve engine quality and subsequently output quality. Grossi notes that a favourite feature of the platform is the KantanWatch™ reporting function, a measurement tool allowing her to track engine quality over time, helping the team to become more adept at choosing training data to reduce set up times and increase productivity. Strategic and selective deployment of Machine Translation within its workflow is enabling RTS to improve capacity and flexibility of translation throughput. In combination with a focused investment in developing resources and capacity for post-editing in order to maintain the same quality standards as with human translation, the company considers it a critical tool for improving efficiency and growing business, as well as offering its customers optimal overall value and service. Grossi concludes that RTS “has increased its productivity on certain translation jobs significantly”, and by implementing KantanMT, “has increased capacity levels to take on translation jobs they otherwise would have had to turn down”. Adopting KantanMT technology has helped RTS successfully create a foundation for ensuring its future business competitiveness.